As of 2010, almost 17% of Americans were experiencing the debilitating symptoms of major depressive disorder – or MDD. The number of sufferers continues to soar, with the national statistics for 2016 indicating that up to 7% of the population struggles with an acute period of depression over the course of any given year. With so many suffering the impact of this disorder, it is important that we are aware of effective treatments. Antidepressants, along with therapy, are still the go-to method of treatment for depression. But many sufferers do not wish to face the multitude of side effects associated with medication. As well, a large percentage of sufferers find that medications do not work for them at all, have limited impact, or stop working over time. For those who do not respond well to medication therapy, alternative approaches are necessary. As new data has become available in the field of neuropsychiatry it has become possible to identify the specific areas of the brain that are impacting major depression. These parts of the brain are target areas for deep Transcranial Magnetic Stimulation (dTMS) treatment. The full name for this treatment is, in fact, a descriptive one. Deep refers to layers of the brain. The prefix, trans, means “across.” The word cranial means having to do with the head. Magnetic is exactly what it sounds like, and it refers to magnetic pulses that are applied to specific areas. Stimulation refers to the magnetic pulses that are producing activity in (stimulating) the regions of the brain where the pulses are being applied. 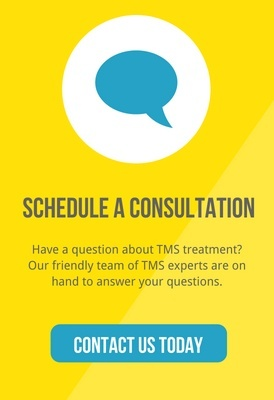 In lay-person terms, dTMS is the gentle and non-invasive process of moving magnetic pulses across specific areas of the brain – while stimulating targeted areas with customized levels of treatment. It requires no anesthesia or hospitalization, and the side effects are minimal. As opposed to standard TMS, deep TMS has the advantage of being able to reach deeper parts of the brain and provide wider areas of effect. Deep TMS does both – without the need for any increase of treatment intensity. This approach has been highly effective for those who do not respond well to using medication for symptom management. Documented results have indicated that over 70% of those being treated with dTMS experience symptom relief, and almost 50% of patients report that the symptoms are alleviated. The large majority of dTMS treatments are being used to successfully treat resistant cases of depression. To this end, several clinical trials on the effectiveness and safety of the dTMS procedure have been conducted. Due to the positive results of these trials, the FDA has approved dTMS as an effective treatment option for those who do not respond well to antidepressants and most major commercial insurance carriers now cover this treatment.